Phoenix, Glendale, Peoria, Young Town, Avondale, Tolleson, Laveen, Cave Creek, Scottsdale, Good Year, Chandler, Surprise, Anthem, El Mirage, Waddell, Paradise Valley, Sun City, Young Town, Mesa, Verrado, Tempe, Gilbert. Water Slide summer rentals in Phoenix Arizona are the most affordable entertainment for family and friend, get together with the next door neighbors and friends and for a few dollars you can enjoy a fun day of Water Slide fun, our water slides range in size color and price, so pick the best water Slide for you. Add a Sno Cone machine to your Water Slide rental and make that a summer to remember! 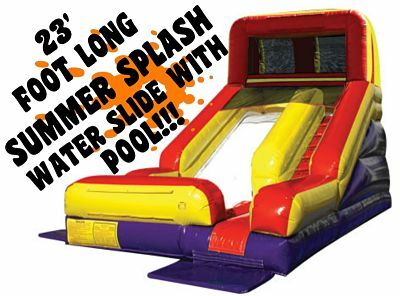 Beside Water Slide rentals we also have Slip n slides that are a great hit for teenagers and adults.as well as Dunk tanks. Coolers, Fans, Sno Cones, Tables, Chairs and Cotton Candy.